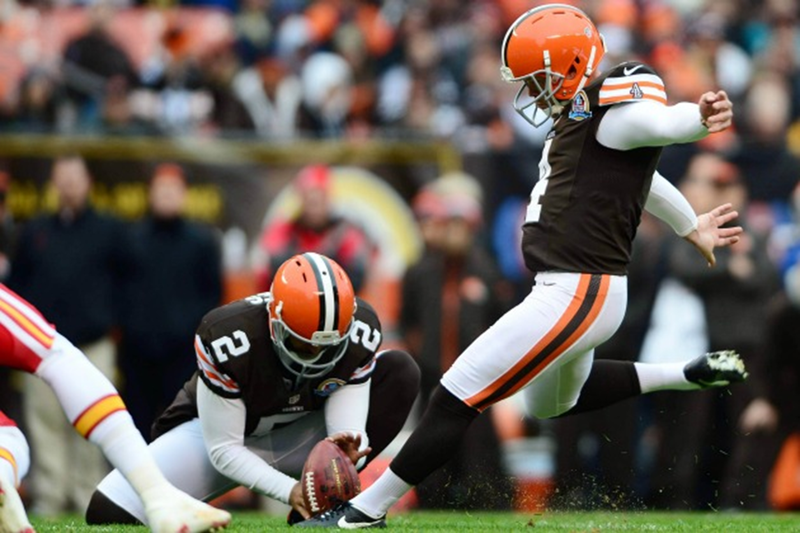 Browns kicker Phil Dawson has been named to USA Football's All-Fundamentals Team. USA Football has selected Cleveland Browns kicker PHIL DAWSON as its kicker on the 2012 USA Football All-Fundamentals Team, which honors 26 NFL players -- 11 offense, 11 defense and four special teams -- who exhibit exemplary football techniques for youth players to emulate. 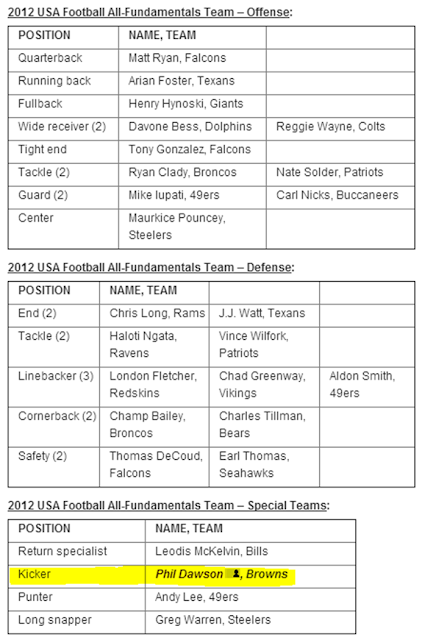 The fourth annual USA Football All-Fundamentals Team recognizes NFL players who employ proper technique, which fosters better on-field performance and inherent safety benefits. Dawson is a kicker who combines accuracy with the ability to connect from long distance. With a solid plant foot and strong posture, he drives power through his hips to strike the ball correctly and retain precision even in the worst weather conditions. Each player chosen for the All-Fundamentals Team will receive a $1,500 equipment grant from USA Football to donate to the youth or high school football program of his choice. USA Football, the sport’s national governing body in the United States, is the official youth football development partner of the Browns, the NFL and each of the league’s other 31 teams. A fan vote will determine All-Fundamentals Team captains at www.facebook.com/usafootball. Fans may vote for one captain on offense, defense and special teams. USA Football will award each of the three captains a $3,000 equipment grant to donate and an All-Fundamentals Team helmet trophy. Voting is open through Jan. 21. More on past USA Football All-Fundamentals Team players’ techniques is available at www.usafootball.com/all-fundamentals-team. About USA Football: USA Football recommends national standards for America’s youth football community. As the sport's national governing body in the United States, USA Football hosts dozens of football training events annually offering education for coaches, skill development for players and resources for youth football league commissioners. The independent non-profit is the official youth football development partner of the NFL and its 32 teams as well as the Atlantic Coast Conference. USA Football manages U.S. national teams within the sport for international competition and awards $1 million annually in equipment grants to youth and high school football programs based on merit and need. USA Football is chaired by former NFL team executive Carl Peterson.